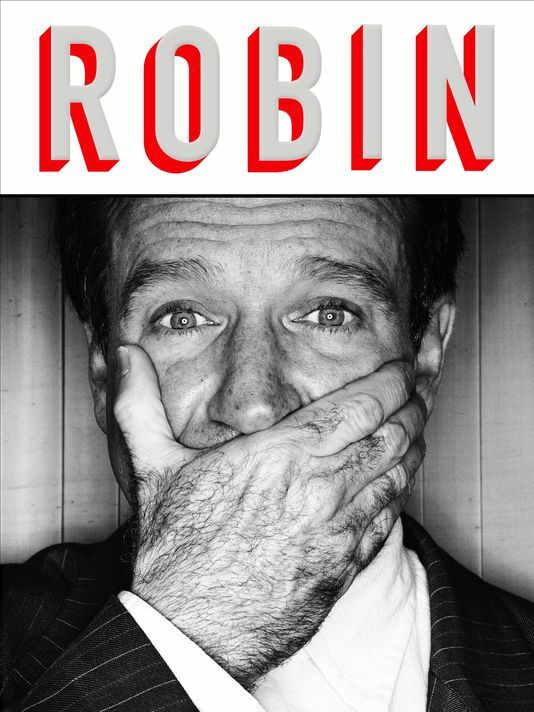 This past month entertainment writer Dave Itzkoff released Robin, an intriguing, detailed biography that tracks the hurtling comet of Robin Williams’ life and career, solving some mysteries, presenting others, and laying him to rest for his many fans. Many of us receive breaking news on our smartphones. On August 11, 2014 I was sitting at a coffee shop when a news alert said that Robin Williams had died by committing suicide. While I generally filter entertainment obituaries at a distance, this time I was floored. Hearing this news felt like losing a friend. It was especially bizarre and sorrowful to hear it so impersonally, in a tiny flashing line of text, about someone who seemed so gentle, kind, and joyful: someone who brought so many people happiness with his comedy. It was terrible to think that he hurt so badly that he would take this way out. When I heard that this book was going to be released it immediately went to the top of my to-read list because I wanted to learn more about him and to understand why he ended his life on his own terms. Itzkoff’s extensive work traces Robin’s childhood as the son of a wealthy Ford Motor company executive and his socialite wife who moved frequently and traveled often, leaving Robin at home with their hired help. He grew up in a conservative Midwestern area outside Detroit, where he went to private schools, earned A’s, and wore a suit and tie. Playing with his collection of toy soldiers as a youngster, Robin staved off his loneliness through enacting elaborate, dramatic battle scenes that may have mirrored some of his own natural internal contradictions. In 1968, when his parents moved to Marin County outside of San Francisco, CA, Robin attended a school almost diametrically opposite in tone and type to the one he had left in Michigan. Adopting liberal California values that better paralleled his own highly imaginative personality, he went to Claremont Men’s College (now Claremont McKenna College) outside of Los Angeles with the intention of eventually becoming a Foreign Service officer. There he first started acting and doing improv, charming many women with his charisma. By spending all his time acting, he flunked out. Afterwards he moved back home, attending the College of Marin, where he focused his energies on theater. After auditioning, he obtained a scholarship to attend Juilliard’s acting conservatory, meeting one of his good friends, Christopher Reeve, there. He befuddled some of his acting instructors, who found him to be so individual that it was almost impossible to break down his idiosyncrasies. When Robin left Juilliard early to return to the San Francisco area, he began doing improv and standup comedy at clubs in the area. After meeting his girlfriend and eventual first wife, Valerie Velardi, at a club, they decided to move to Los Angeles so that he could measure himself against the competition in a city that celebrated standups. Exploding on the scene in a way that no one had previously seen at the Improv and the famed Comedy Store, he easily secured representation with the highly prestigious Rollins, Joffe, Morra & Brezner agency. Robin skyrocketed into the television stratosphere by acting the part of the alien Mork from Ork on the Mork & Mindy show, where he could expand on all the crazy, manic personalities that his improv and standup presented. As a kind, funny individual, he had many friends in comedy and improv, but was so unique that he sometimes had trouble working seamlessly in an improv troupe. While he stood out and intimidated others with his lightning-strike mind, his individuality also increased his feelings of being an “other,” someone whose zany impressions and high-wattage persona hid a shy and often quiet man who rarely let others see beyond his many personae. Through Itzkoff’s thorough research and multiple interviews with Robin’s friends, colleagues, and family, Robin appears as a comedic and dramatic actor so original that he found it hard even to locate the right movies or programs in which to star. He was nominated for four Academy awards and eventually won Best Supporting Actor for Good Will Hunting. For every critical or commercial success such as Dead Poets’ Society, Good Morning Vietnam, The Birdcage, or Mrs. Doubtfire, he picked multiple bombs that fed his need to keep working frenetically at any cost. In total he featured or starred in over seventy movies, many of which few could name without research. Afflicted with self-doubt, he often questioned his own abilities, never acting as if he felt that he was better than friends and colleagues, whether they were famous or not. Suffering from drug addiction, he stopped only to fall off the wagon years later, eventually following a twelve-step program successfully to the end of his life despite his health problems. Robin’s sensitivity made him compassionate when it came to humanitarian issues, which led him to join Billy Crystal and Whoopi Goldberg to host Comic Relief on HBO, a recurring special that raised money over many years for the homeless. He also visited the troops in Iraq and Afghanistan on USO tours, giving respite to and gaining a special connection with the men and women risking their lives overseas. Even after reading this work, it seems hard to pin down Robin Williams, a comedic genius who kept parts of himself so private that even family and friends who loved him didn’t know them. He was publicly loud and privately quiet, a once–in–a–lifetime talent who never felt good enough. As someone who easily tapped into the veins of humor and tragedy that flow through human experience, he often did so to the detriment of his own equilibrium. In the wake of his suicide, the public assumed that he had become so depressed that he saw no way to continue. Months earlier he had been diagnosed with Parkinson’s disease, which doctors told him would allow him ten good years with the proper medical treatment. After his death, his autopsy found that he suffered from an uncommon, easy–to–misdiagnose disorder called Lewy body disease. Very similar to Parkinson’s, this disease built up abnormal levels of proteins in his brain. It slowly attacked his mental acuity and physical movements, causing a decreased range of motion, depression, insomnia, and an increased risk of suicide. Robin started losing his photographic memory, often becoming paranoid or going into temporary fugue states. His close friend Billy Crystal stated “Think of it this way: the speed at which the comedy came is the speed at which the terrors came. And all that they described that can happen…the hallucinations, the images, the terror—coming at the speed his comedy came at….I can’t imagine living like that.” While depression played some part, it is probably that he was not in his right mind for these other reasons when he decided to end his life. In taking the reader through Robin Williams’ life, marriages, relationships with his children, friendships, and career, Itzkoff’s meticulous biography depicts a firefly on steroids, a bawdy, hilarious performer whose intelligence and warmth attracted a loving public around the world. His generosity of spirit drew people to him, and his self-doubts caused him to keep himself hidden from most. Google “Robin Williams Inside the Actor’s Studio full episode” to watch him at his improvisational best, delighting an audience of training thespians with an electric cavalcade of impressions. Read this book to better understand the wonderful, flawed human being behind the masks.